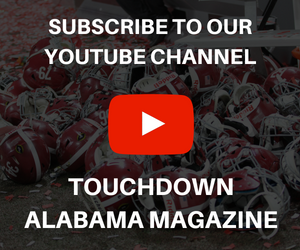 Although its offense returns more pieces, the defense for the University of Alabama football program is fueled by vengeance, passion and with the new coaches hired, it has much determination to be the most feared group in college football in the coming fall. After years of strong play, the Crimson Tide allowed 18.1 points a game in 2018 – the second-highest of the Nick Saban era since 2014. The mixture of freshmen arriving for the 2019 class and veterans back to work with defensive coordinator, Pete Golding, spring practice will be interesting. Follow a peek of the five offensive leaders for the program going into spring ball, listed below is a breakdown of the five defensive guys to watch for when March rolls in. All eyes are back on him. Whether it was drawing too many double-teams or not giving a full effort, Raekwon Davis did not have the junior season he wanted. On the heels of a tenacious sophomore year, the native Mississippian saw his numbers decrease in tackles, tackles for loss and sacks in 2018. 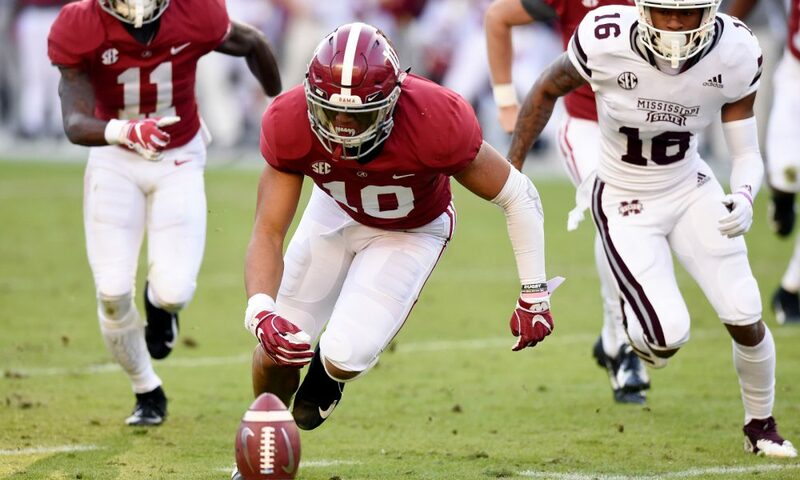 The 6-foot-7, 316-pound defensive end had 55 tackles – including 5.5 stops for loss and 1.5 sacks, but the leadership role returns to him with Quinnen Williams and Isaiah Buggs both headed to the National Football League. Davis has an opportunity to show Brian Baker (defensive line coach) and Pete Golding that he is about business in spring practice. He did not have the greatest success in the College Football Playoff; nevertheless, it was an outstanding freshman year for Patrick Surtain II. 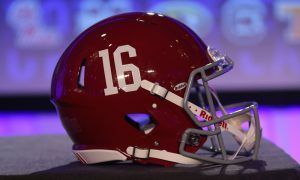 He joined Tide receiver Jaylen Waddle as a member of three All-Freshman Teams – Southeastern Conference, Associated Press and Football Writers Association of America – while forcing quarterbacks to not test his side of the field. Surtain picked up 37 total tackles, 1.5 tackles for loss, seven pass breakups and one interception through 15 games in 2018. 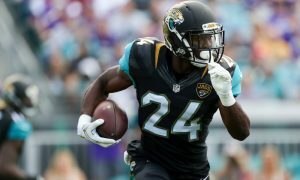 Defending back shoulder throws and keeping leverage on wide receivers are both areas of his game that need improvement. 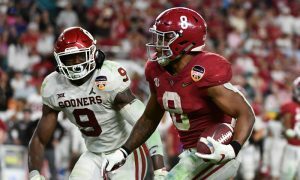 Facing a talent like Ceedee Lamb in the Orange Bowl was needed for him, because it will push Surtain to fine-tune his game versus Jerry Jeudy, Henry Ruggs III, DeVonta Smith and Waddle as he enters his sophomore campaign. 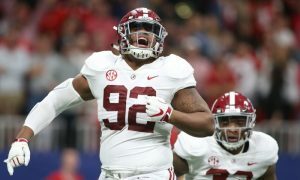 He will be in the midst of fierce competition, but Phidarian Mathis has what it takes to assume the role of defensive tackle that Quinnen Williams leaves behind. Listed at 6-foot-4 and 310 pounds, the Louisiana native was cracking skulls in 2017 during his redshirt year in practice as a freshman and totaled 18 tackles last season. He made a few plays versus the Sooners at Hard Rock Stadium in the CFP semifinal and made the All-SEC Freshman Team. 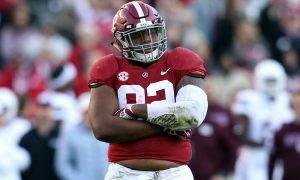 Mathis carries more of Alabama’s ideal size at nose tackle, but he has to possess the hands and active quickness of Williams in terms of disrupting opponents. True freshman D.J. Dale and redshirt freshman Chris Barmore will push Mathis for the spot; however, the rising sophomore should ultimately win the job. He has proved to be strong on special teams and a thumper in the secondary, but the next area of growth for Jared Mayden is his coverage skills at safety. With Deionte Thompson going to the NFL Draft, Mayden is one of multiple guys in the mix to take over at free safety next season. 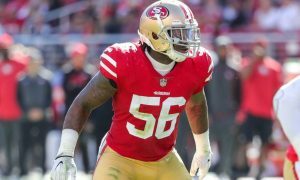 The 6-foot-1, 197-pound native Texan tallied 18 tackles, one tackle for loss, one sack and two pass breakups through 15 games in 2018. 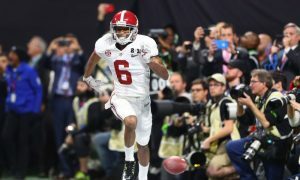 Mayden was called for targeting in the Iron Bowl against Auburn and missed the first half of the SEC Championship matchup with Georgia. When one also considers that Kyriq McDonald inserted his name into the transfer portal, a lot will depend on Mayden’s ability to defend the field. Lyndell “Mack” Wilson was good, but Ale Kaho is going to be a superstar. He already carries the build of former Alabama linebacker, C.J. Mosley, and some think the sophomore has his intelligence as well. Kaho has quick hips and feet for lateral movements, while having tendencies to track plays down. He was exceptional on special teams last year, recording 11 tackles. With he and Dylan Moses on the field together, Tide fans are very excited about the linebacker position.